At the invitation of the governments of Ukraine, Greece and Italy, Vice Premier of the State Council Ma Kai will travel to Ukraine to co-host the Third Meeting of the China-Ukraine Intergovernmental Cooperation Committee and pay official visits to Greece and Italy from December 4 to 13. In Ukraine, Vice Premier Ma Kai will meet and hold talks with Ukrainian leaders and co-host the Third Meeting of the China-Ukraine Intergovernmental Cooperation Committee. The China-Ukraine Intergovernmental Cooperation Committee was set up in April, 2011 as an important platform to make bilateral practical cooperation better planned, guided and coordinated. During this meeting, the two sides will comb through the cooperation outcomes of the past few years and explore ways to further deepen practical cooperation. In Greece, Vice Premier Ma Kai will meet and hold talks with leaders of the Greek government to exchange views on bilateral relations and all-around cooperation, enhance political mutual trust, further align the development strategies of the two sides, strengthen practical cooperation under the Belt and Road, and elevate the China-Greece Comprehensive Strategic Partnership. In Italy, Vice Premier Ma Kai will meet and hold talks with leaders of the Italian government to consolidate bilateral relations and all-around cooperation, reinforce political mutual trust, cement traditional friendship, seek closer practical cooperation under the Belt and Road, and move forward the China-Italy Comprehensive Strategic Partnership. 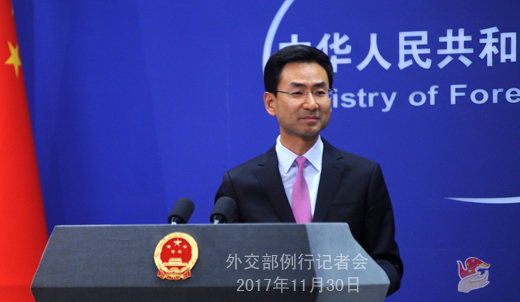 Q: We know that Special Envoy of the Chinese government and Assistant Foreign Minister Chen Xiaodong is now visiting Zimbabwe. Regarding his visit, do you have more details to share and what is your comment? A: At the invitation of the Zimbabwean government, Assistant Foreign Minister Chen Xiaodong is now on a visit in Zimbabwe in the capacity of Special Envoy of the Chinese government. He has met with President Mnangagwa and will also meet with acting Foreign Minister Mumbengegwi. Chen Xiaodong delivered a message from President Xi Jinping to President Mnangagwa in which President Xi expressed his congratulations once again to President Mnangagwa. President Xi stressed that China and Zimbabwe are good friends, good partners and good brothers who understand and have long been supporting each other. Bilateral relations have withstood the passing of time and the changing of international landscape. China firmly supports Zimbabwe in pursuing a development path suited to its national conditions and believes that the Zimbabwean government and people have the wisdom and capacity to handle well their domestic affairs. 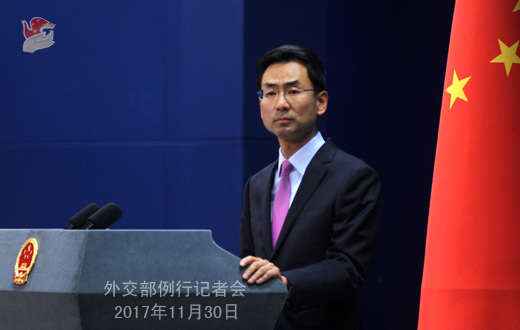 Adhering to the principles of sincerity, real results, amity and good faith and upholding justice while pursuing shared interests, China will strengthen its cooperation with Zimbabwe on the basis of equality, mutual benefit and win-win cooperation and assist Zimbabwe's efforts in realizing economic and social development and improving people's life to the best of our capacity. President Mnangagwa expressed his thanks for President Xi's congratulations and sent his regards for President Xi. President Mnangagwa said that the Chinese government's Special Envoy is the first foreign envoy he received after assuming office, which speaks volumes for the ever-strengthening and special friendship between Zimbabwe and China. The two sides had an in-depth exchange of views on China-Zimbabwe traditional friendship, all-around practical cooperation and international and regional issues of mutual concern. I believe that with the concerted efforts of the two sides, this visit will further elevate the traditional, friendly and cooperative relations between China and Zimbabwe. Q: The US Ambassador to the UN Nikki Haley said that in response to the latest missile test from the DPRK, China should cease oil exports to the country. What's your response? A: Yesterday, I have given my response to a similar question. The UN Security Council has adopted a series of resolutions regarding the DPRK, which we believe shall be observed and implemented comprehensively and thoroughly. We have been comprehensively, thoroughly, conscientiously and strictly implementing relevant resolutions and fulfilling our international obligations. We will continue to approach the relevant issue in ways that are conducive to realizing the denuclearization of the Peninsula, maintaining peace and stability on the Peninsula, and resolving the relevant issue through dialogue and consultation. Q: The China Daily newspaper had an editorial today in which it said the clock was ticking down to two choices, one was war and the other was accepting a nuclearized DPRK. What is the position of the Foreign Ministry on that? Is China increasingly resigned to accepting a nuclearized DPRK? A: In principle, we do not respond to or comment on whatever is said by the media or scholars or experts. I want to stress two points. First, China is committed to realizing the denuclearization of the Peninsula and preserving the international nuclear non-proliferation regime. We hope the international community could jointly work for this goal. Second, as said many times, the Peninsula nuclear issue, in the final analysis, must be properly resolved in peaceful ways through dialogue and consultation. The use of force and military means is not a viable option. Q: Former US President Barack Obama has met with President Xi Jinping. What was discussed between the two? A: I took a similar question yesterday. Former President Obama is on a visit in China. As for any information about his meeting with President Xi Jinping, we will release relevant information in due course. Q: Will Choe Ryong-hae, vice Chairman of the Central Committee of the DPRK Workers' Party, be attending the CPC in Dialogue with World Political Parties High-level Meeting? 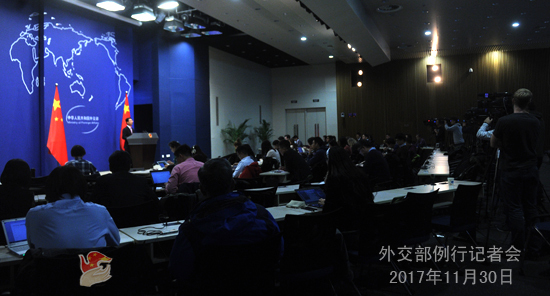 A: As for the CPC in Dialogue with World Political Parties High-level Meeting, I would refer you to the event organizer.